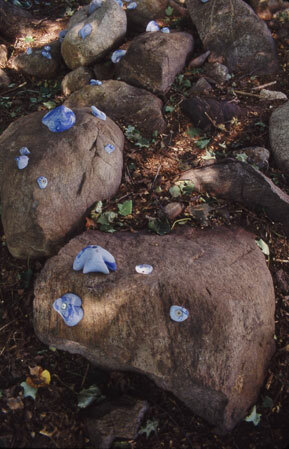 For the Neuberger Public Art Biennial in 2003 these ideas came into play with Parasite, an outdoor piece where hundreds of bright blue resin-cast rock climbing holds were attached to low-lying rocks in a shaded grove. 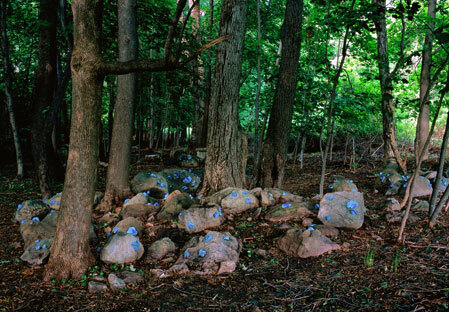 The bright blue "glow" seen at a distance seemed organic, like a carpet of bluebells or a fungus. When seen up close, the tumorous forms revealed themselves as highly unnatural. 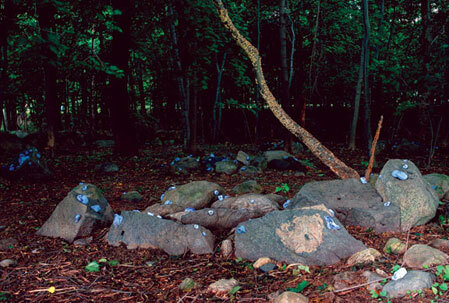 Rock climbing holds of this type are meant for indoor use to simulate rock surfaces for practice purposes; by attaching them to the very thing they are trying to imitate, they became parasites that called their naturalism into question.